THERE ONCE WAS A FISHERMAN who was afraid of nothing except drowning, who fell in love with a mermaid. The mermaid, of course, could not live above the water, and the fisherman could not live beneath it. So every night they would meet at the surface, she reaching up from the sea, and he leaning over the side of his boat, and they would kiss. And every night he felt that kiss a little differently. Sometimes it was gentle, like ripples in rock pools; sometimes playful, like foam at the edge of the beach; and sometimes wild, like waves pounding themselves against the cliffs. Day by day, breath by breath, he started to taste how dry the air was, and each day he ached for the evening when the mermaid’s kiss would once again wash over him. Perhaps to her those kisses tasted like wheat on high hills, or gritty stones on mountains, or just bare, dry bones—but we will never know. The fisherman was happy; but love casts a shadow on those it leaves behind, and that shadow is called jealousy. So the fisherman’s wife and the fisherman’s children knotted together an iron net of wicked, barbed chains, and caught the mermaid while the fisherman was fishing elsewhere. They killed the helpless creature, quickly, with dry knives, and burned her body, completely, on a hot, dry fire. Less than seven kissless nights later the fisherman was dead, curled up in the bottom of his boat like a piece of dry rope, with his mouth and eyes wide open like three round ‘O’s. The doctor came to look at him to determine how he had died, as usually happens. He inspected the dry corpse carefully and gently. He was a thorough man, so he went back to the house and looked at the wife and children too. This made them uncomfortable, but nonetheless none of them told him about the mermaid, nor said anything of her murder. “I don’t know,” replied the doctor. “P’raps it’s just one of those things,” says she, “and he died of something and nothing, eh?” She smiled a smile that she didn’t mean to be as crooked as it was, and showed the doctor the door. But the doctor sat down at their table, and opened his little leather-bound casebook. He dipped his pen in ink and wrote a quick note. Then he wiped off the nib and snapped the little book shut, and stood to take his leave. He told the cruel family that their fisherman had died of a broken heart. But in his little book he had written what he really knew, strange though it was: the fisherman who was afraid of drowning had suffocated in the dry, dry air, exactly like a fish out of water. 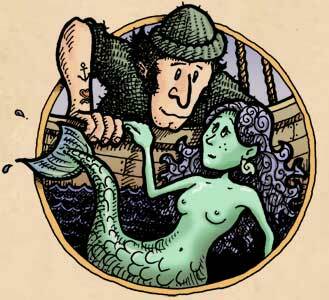 The Fisherman & the Mermaid story appears, told in a slightly different form, in the Water book of The Knot-Shop Man. The Fisherman & the Mermaid is licensed under a Creative Commons Attribution-Noncommercial-No Derivative Works 3.0 Unported License (which means, roughly, that you're welcome to distribute it provided you attribute it and don't charge for it).